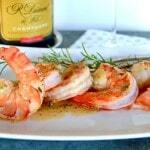 Cajun Shrimp Appetizer–A simple yet impressive recipe that mimic’s Ruth’s Chris famous Spicy BBQ Shrimp. 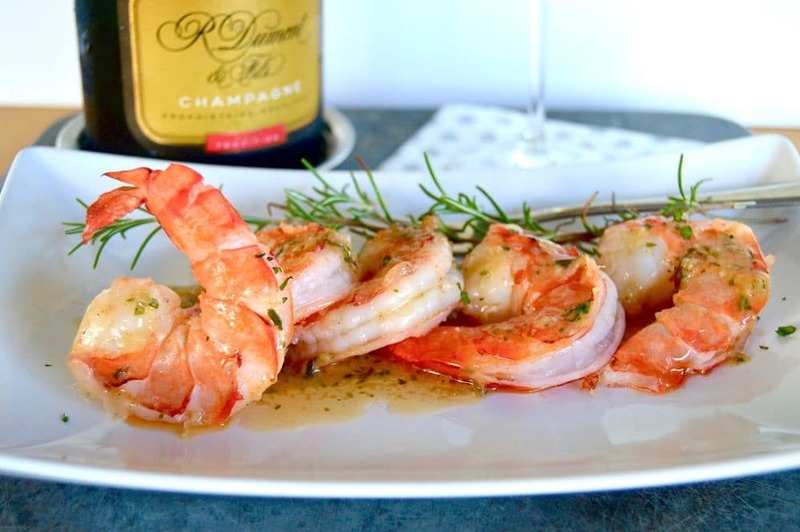 It’s full of flavor from garlic, spices and butter drizzled over the top of succulent shrimp. One of the first fancy restaurants I went to when I moved out to California was Ruth’s Cris. They are known for really good steaks served sizzling hot on top of a 500° plate with sizzling fresh butter drizzled over them. Seriously, if you’ve never been there you have to put it on top of your to do list ASAP. They also have some really good side dishes and appetizers. One of my favorite appetizers they offer is Barbecue Shrimp. It’s not barbeque in the traditional sense that it has a sweet barbeque sauce, but rather shrimp in butter (of course) with lots of spices. They serve the shrimp on a deep sided plate filled with melted butter plum full of all sorts of spices. It’s served along with fresh warm bread to sop of that fabulous sauce when you’ve devoured all of the shrimp they give you. What is the time saving trick with this Cajun Shrimp Appetizer? This recipe makes a lot of seasoned butter. I make this Spicy BBQ Shrimp Appetizer with an entire pound of butter but only use small amounts when making this particular recipe. 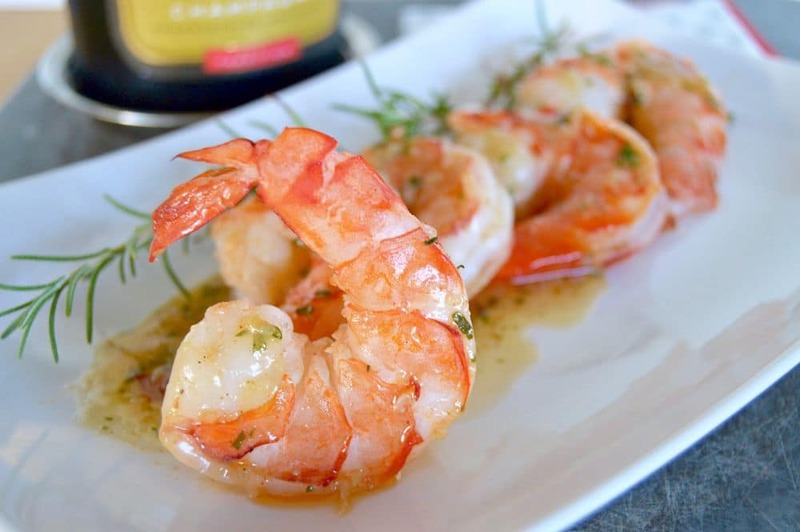 Making the Cajun Shrimp Appetizer is as easy as making a simple compound butter to go with it. Sauce the garlic and caramelize it so it is a deep rich flavor. Add all spices and flavor enhancements to the butter. Whip the butter using a whisk attachment to make it light and airy. Onto a sheet of parchment paper, place a could of scoops. 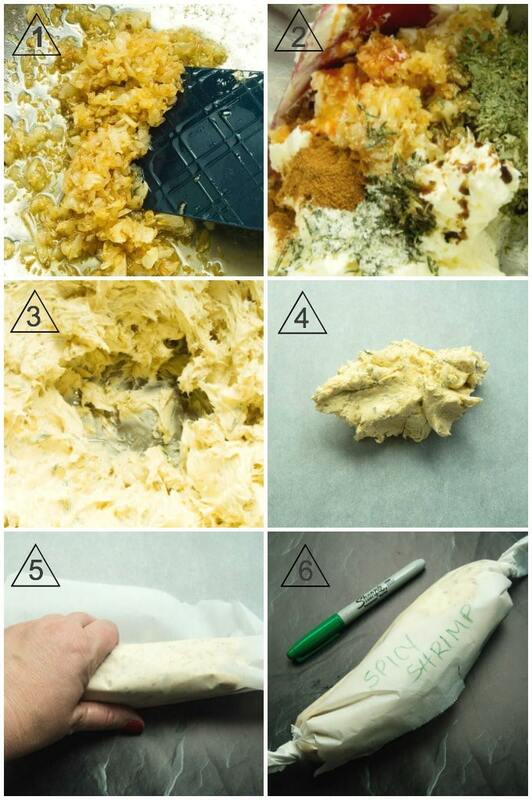 Roll the parchment and butter into a log shape and twist the ends. Mark the log with what it is for when you are looking for it in a month or so you know just what it is! With the extra butter I save it in log form in parchment paper and keep it in my freezer for a later use at a moment’s notice. That little trick allows me to have something at a moments notice to serve if someone comes over unexpectedly. The butter is so full of amazing flavors all you really have to have on hand is some bread, (or shrimp of course) to serve it as an appetizer. Since I always have a loaf of bread around I’m always covered. The butter also works well tossed with a simple pasta, or as a butter topping for a steak. Don’t you just love recipes that are multi use recipes. Once you have the compound butter, all you need to make the Cajun Shrimp Appetizer is melt the butter in a sauce pan then add the shrimp and serve! How easy is that to make a Spicy BBQ Shrimp Appetizer? This recipe for Spicy BBQ Shrimp Appetizer takes less than a half an hour from start to finish. Less if you make the butter ahead of time. It has so many flavors going on it just makes you happy when you eat it. If you like this recipe with shrimp you’ll also like my recipe for Simple Coconut Shrimp, both being easy and full of great flavor. Craving more recipes for Holiday entertaining sign up for my mailing list here at the bottom of the page. PIN THIS TO YOUR HOLIDAY APPETIZER BOARD for when you are looking for ideas to make for special occasion entertaining! Follow me on Pinterest to get more ideas to have for making easy delicious meals and appetizers for any entertaining! MORE CAJUN CREOLE RECIPES YOU MIGHT ENJOY! 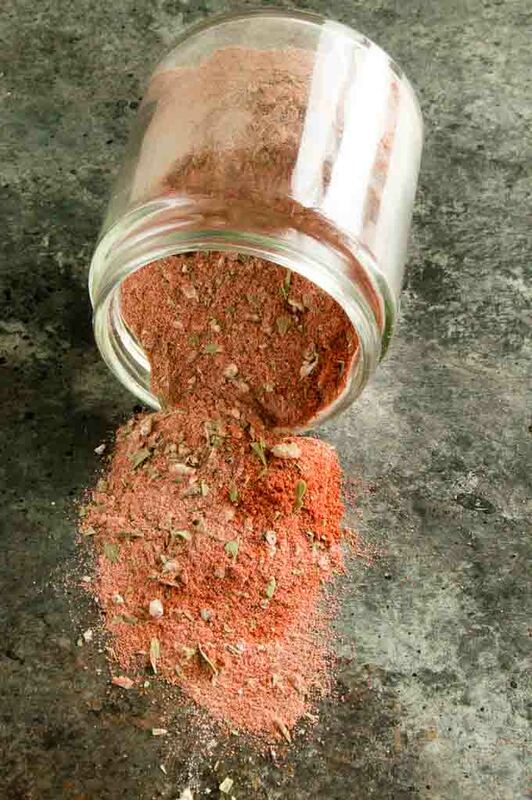 Cajun Creole Seasoning Mix to place in any sauce! A simple, but impressive recipe that mimic's Ruth's Cris famous Spicy Barbeque Shrimp Appetizer. It's full of the flavors of garlic, spices and butter drizzled over the top of succulent shrimp. Soften butter to room temp. Place butter and all other ingredients in a mixing bowl (kitchen aid) and whip for about 3 minutes until thoroughly blended. Shape into 2 logs, wrap in parchment paper and put in freezer to chill (at least an hour (This can be done ahead.). The recipe will use only one log save the other one for another time. Pour olive oil in a hot sauté pan. Add shrimp and cook on one side for 1-2 minutes. Don’t overcrowd, do in batches if necessary. Reduce heat to medium and flip shrimp. Add green onion and cook for 2 more minutes. Remove Shrimp from pan to a side plate. Add white wine to pan and cook until it is reduced to ¼ cup. Reduce heat to low and cook until shrimp is cooked through. Serve from a serving dish with rosemary or fresh tarragon sprinkled or laid over the top. Have sliced sourdough baguette for serving. (Cut bread into triangle chunks and toast in the broiler for serving. Other ways to use the butter in notes! I make this butter blend in bulk because it is so easily adapted for many things. Serve it as a melted butter dip for warmed bread. Use a couple of tablespoons tossed with your favorite pasta. Add any protein for a more substantial meal. Top your favorite steak with a pat of the butter right before serving. Store leftover butter in the freezer until ready to use. The calories are for shrimp and butter only. Bread is not included. Our youngest worked at Ruth’s Chris while he was at the Culinary Institute! I’ll have to ask him about these… they look fabulous! Love these! Pinned to try them! This shrimp is just perfect! Lightly sauced and perfect for the holidays! Yum! I love shrimp so much and this looks amazing! 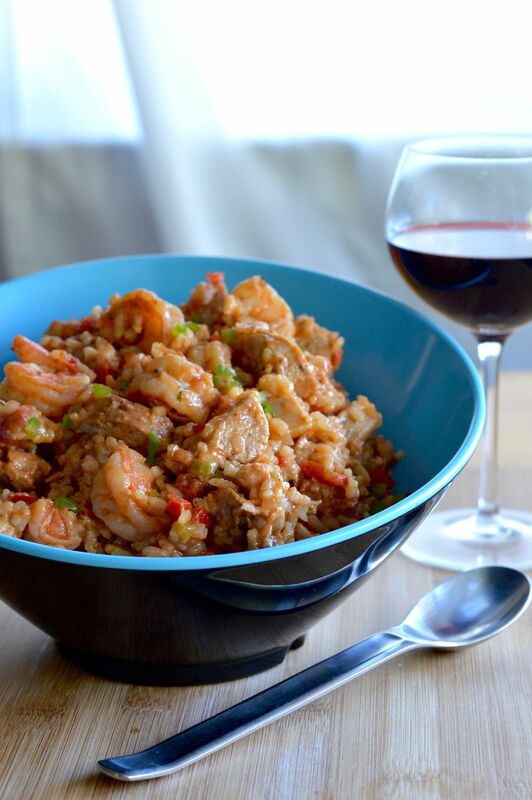 All 5 of us love anything with shrimp, need to try this this week. Im with you…. anything with shrimp is a WIN in my world! We took a trip out to Boston 2 weeks ago and we had so much seafood–now that I am back in Phoenix, I am craving nothing but seafood. This recipe looks amazing!! Can’t wait to try it! Shrimp is my very favorite food – and that butter sounds amazing. I like the simple things, so your butter with a little pasta sounds right up my alley! These look absolutely incredible! I can’t wait to try out your recipe. This looks delicious! Going on my must make list! Yum! These look amazing. The butter sauce sounds delicious and I would love to try it over some pasta. I love that you can keep some of the butter in the freezer for use later. This looks (and sounds) spectacular – definitely going on my shortlist of recipes to try! Shrimp is my all-time favorite kind of seafood! This recipe looks deeeelish! What a tasty treat! My hubby would LOVE this! Spicy, BBQ-y, shrimp! I love this! That butter is mouth-watering! Love this style of cooking. This looks delicious. 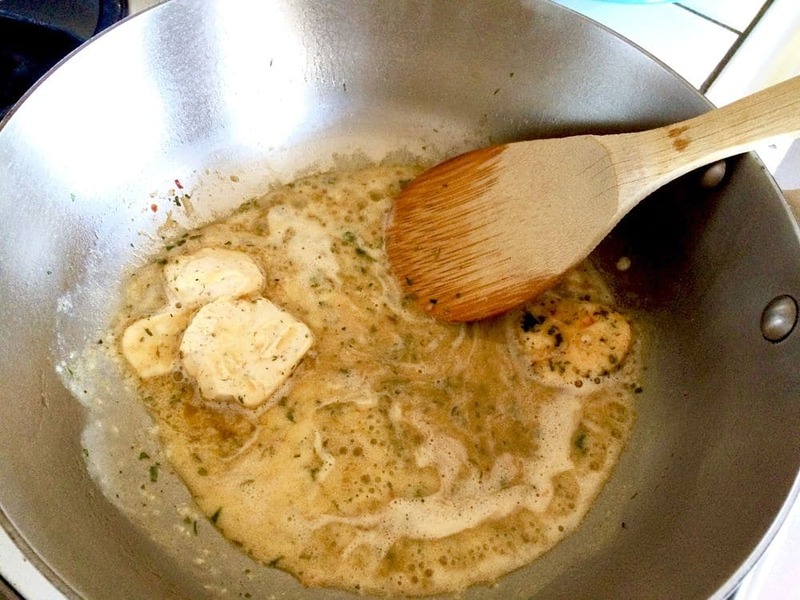 Butter sauce…yummm. Can’t wait to try! Love the fresh rosemary. Nice touch! Oh what a delicious appetizer! That shrimp looks soooo good! That butter sounds positively delicious… in fact, I’d be sorely tempted to just skip the shrimp and serve up a big dish of the melted butter to dunk my bread in. 😉 I suppose the shrimp mean you can convince yourself the butter is just sauce, rather than the main event, and therefore feel less guilty about it. Copycat recipes are awesome….perfect way to enjoy the high priced foods at the restaurant … it always tastes better when you make it at home. 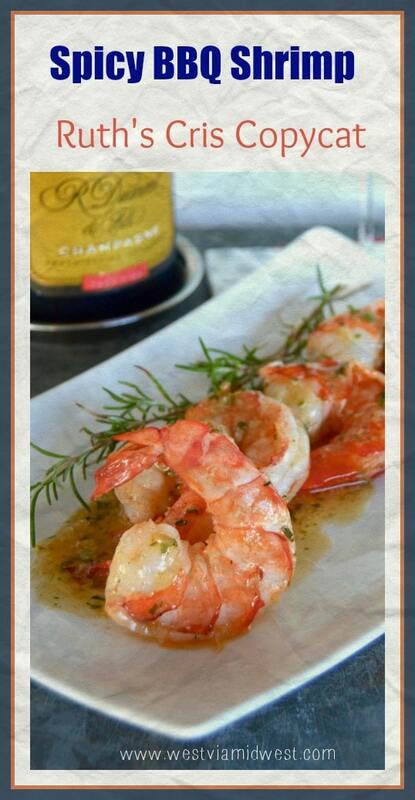 This shrimp recipe looks devine! Lots of great flavors going on – scrumptious! Rosemary, garlic, tarragon, cayenne. Oh Man these sound divine!!!! That butter sauce…. yum! Can only imagine how good that would go with the prawns. These look amazing! I was just there for Christmas dinner and saw the BBQ shrimp on the menu. Can’t wait to make them at home. These shrimp look beautiful and I can’t wait to try them! Pinned! This is simply awesome and looks delicious. And the fact that it takes less than 30 minutes is just icing on the cake.